Instagram is adding adverts to Instagram Stories. Because with great power comes great responsibility with great popularity comes great potential to make money. Thankfully these video ads aren’t going to be as bad as all that. But still, they’re ads, and no one likes ads. In August 2016, Instagram launched Stories. This was Instagram shamelessly copying Snapchat. Instagram Stories is an app within an app How to Use Instagram Stories Effectively: Basics, Tips, and Tricks How to Use Instagram Stories Effectively: Basics, Tips, and Tricks Instagram Stories is the photo-sharing giant's take on Snapchat. The purpose is to add a new layer of fun to your images and videos. Here's everything you need to know. Read More , letting you create montages of recent photos and videos in order to tell the story of your day. Instagram Stories became very popular very quickly, racking up 100 million daily users by October. 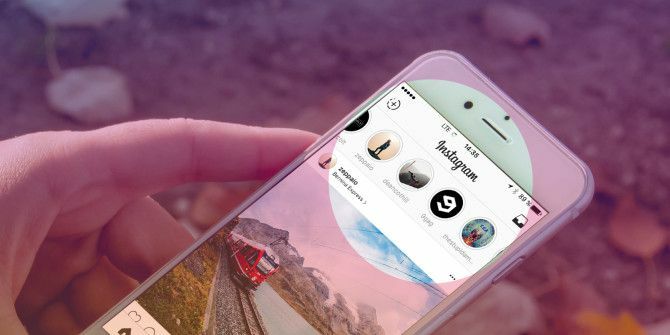 It now has 150 million daily users, so Instagram is adding video adverts to Stories in order to wring even more cash out of the app. The video ads being added to Instagram Stories will be between 5 seconds and 15 seconds in length, and appear between stories. This means they won’t interrupt the flow of anyone’s montage of yet another boring day at the office 20 Fun Things to Do Online When You're Bored at Work 20 Fun Things to Do Online When You're Bored at Work These websites are guaranteed to ease your boredom at work. Because we know that even the best jobs have their bad points and those moments when boredom sets in. Read More . The ads will be clearly labeled as sponsored content, meaning you’re unlikely to mistake an ad for your friend’s content. And they will all be skippable, saving you the ignominy of having to sit through them in full. Instagram has initially partnered with just 30 brands, including Nike, Netflix, Airbnb, Capital One, and General Motors. However, Instagram will be rolling these out to all advertisers globally “in the coming weeks”. Adding adverts to Stories is a no-brainer for Instagram. With 150 million people now using Stories on a daily basis, that’s a lot of potential eyeballs for advertisers 10 Sites To Watch The Very Best Of Funny & Creative Advertisements 10 Sites To Watch The Very Best Of Funny & Creative Advertisements Read More . And eyeballs for advertisers means revenue for Instagram. However, Stories has only been around for five months, so Instagram is taking a risk monetizing it this quickly. If enough users are put off by the addition of ads, the popularity of Stories could soon dwindle away to nothing. Do you use Instagram? Have you dabbled with Instagram Stories yet? How do you feel about adverts being added to Stories? Will you be skipping every one? Will these ads put you off using Instagram Stories? Please let us know in the comments below! Explore more about: Instagram, Online Advertising, Online Video.